Pilates targets the deep postural muscles, building strength from the inside out, rebalancing the body and bringing it into correct alignment. It helps to reshape your body, which will become longer, leaner and more toned. It will also improve your posture, achieving the perfect balance between strength and flexibility, and it is a great way to relieve unwanted stress and tension. It is perfect for athletes looking to enhance their performance and avoid the risk of injury, and it is also ideal for first-time exercisers. Its slow, controlled approach means that it gives much longer-term results. It is especially recommended by medical specialists for those with back problems. What makes the Body Control Pilates Method different? Body Control Pilates is based on the work of Joseph Pilates (1880-1967), who created a series of exercises that built strength without adding bulk and balanced that strength with flexibility. The Body Control Pilates programme offers a comprehensive programme of exercises at all levels for both mat and machine work and there are more than 100 different matwork exercises alone. They are adapted from the classical exercises developed by Joseph Pilates, many of which are often not suitable for the average person and the average body. In order for someone to work safely and effectively and to gain the full benefits of Pilates, these classical exercises should be broken down to establish good movement skills thus building the best possible foundation upon which to progress towards the classical, more advanced work. This is the essence of the Body Control Pilates Method. By working on the deep architectural structure of the body, ‘core stability’ is achieved, and then maintained, through increasingly complex movement sequences. Specific problem-areas can be targeted by an exercise, but always in relation to the rest of one’s body. Your body awareness is heightened by bringing together mind and body – Body Control Pilates literally teaches you to be in control of your body, allowing you to handle stress more effectively and achieve relaxation more easily.The Body Control Pilates Method can work for everyone, regardless of fitness level! Exercises can be mat or machine-based, but matwork exercises have a great attraction in that they need no special equipment, and are particularly safe for those with back problems (and don’t forget that 95% of the UK population has, or has had, backache). Its consistent success rate in solving such problems has brought it to the attention of osteopaths, chiropractors, physiotherapists and homeopathic doctors, many of whom are very happy to refer their patients to Body Control Pilates teachers. Good movement skills are taught step-by-step, which will ultimately give you the strength and flexibility you need to perform the more advanced classical Pilates exercises. Body Control Pilates teachers have access to a huge range of exercises but, most importantly, they know how to teach them well and how to adapt them to suit each client. 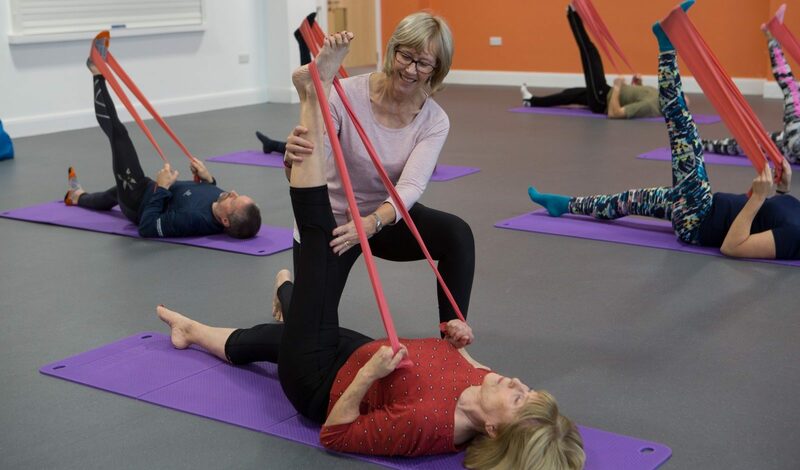 Before your first session, your Body Control Pilates teacher will ask you to complete an enrolment form, where you can give details of any injuries or conditions so that they can ensure that you exercise safely. All Body Control Pilates teachers work to a maximum group class size of 12, ensuring close supervision and support from your teacher. Many work with smaller class numbers. Body Control Pilates teachers work to a Code of Practice that governs teaching standards and professional ethics. All teachers hold valid insurance and CPR certification. For more information on Body Control Pilates, click here.